It’s all go in the kitchen! Eager to use up some of my surfeit of tomatoes, I checked my cookery books for another chutney recipe and came up with one I hadn’t made before, but I needed some courgettes. This was my incentive to get out into the garden to check my veg plot. Not wanting to have to clean out mud from the many grooves on the bottom of my boot, I came up with the idea of putting a shower cap over it. This worked admirably, so I set off down the garden with a spring in my step (tee hee ee). Luckily, I discovered some courgettes hiding under their leaves, so I had all the ingredients needed for this new recipe. Follow the instructions for my red tomato recipe which is, basically, chop everything and chuck it all in together, couldn’t be easier! I found that after it had simmered, covered, for an hour I had to simmer it (uncovered) for a further 45 minutes to reduce the liquid. I couldn’t recommend this recipe more highly, it is scrumptious and it makes lots and lots! Lots, and lots, that’s 8 and a half jars. As you can see, I’ve already started to gift them to my lovely helpers. In the background is a wonderful card of two frolicking Jack Russells sent to me by Liz. Thanks Liz what a joyous photo. Wish I’d taken it! I am finding all these home preserves are great ‘thank you’ presents! Marion, my next door neighbour was the first to receive a jar in thanks for taking me to the post office and to my local horsefeed/tack shop yesterday. Was running low on one of Max’s foods (his coarse mix) and food for young Alfie. She does her ‘own mix’ dog food (two types) as well as hacking mix, which Max looks really well on. Both are much cheaper than proprietary brands, which is great for my pensioner’s pocket! Hope the little fella enjoys his new biscuits more than his current ones. If he doesn’t, then Nicky has given me a great tip that has him wolfing them down, like he used to with the tinned food. I just take a scraping off the top of Minnie’s cat food tin; mix it with some warm water then mix in his biscuits. I don’t know whether it’s the smidgin of cat food, or the warm water, but he wolfs down his biscuits in one go. Marvellous! I still have lots of green tomatoes, ripening slowly in a plastic bag, together with one ripe one. I have another excellent recipe, this time for green tomatoes, which I’ll use with the green tomatoes that don’t want to turn. More about that later. Some time ago, before I broke my ankle, I made some blackberry surprise cupcakes to take to a MacMillan coffee morning at Orchard Toys where I used to work. When shopping for ingredients, I took advantage of a ‘buy one, get one free’ offer on butter. So, as I had a spare pat of butter in the fridge, I decided, against my better judgement, to bake a cake. As it was getting late last night when I got started, I decided that a Victoria sponge would be the quickest. Abandoning my cookery books for once, I did an internet trawl. On reading Mary Berry’s recipe on the BBC website, I just had to go for it. 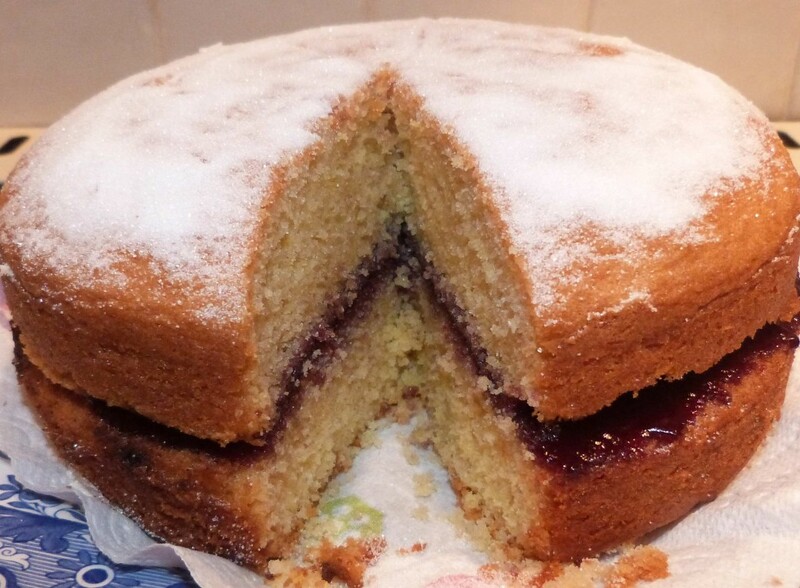 I can remember cooking a Victoria sandwich in my cookery class at school, 50 years ago. I can remember our domestic science teacher (whose name I can’t remember, but whose face I can see as if it was yesterday) telling us to change from a wooden spoon to a metal one when folding in the flour. Changing over spoons was to remind us that we weren’t beating any longer. We had to gently, very gently, mix in the flour. What did I like about Mary Berry’s recipe? Well, strangely enough, you just dump all the ingredients in the bowl at the same time, and set to with your electric whisk! No need to gently fold the flour in ! Just whisk away! It was marvellous, so much quicker. Think of all those hours of my life I have lost, hand beating sugar and butter, then slowly adding the eggs, one at a time while continuing to beat. Phew, what a lot of labour! I was intrigued to know how it would turn out. Needless to say, nom nom, that it’s brilliant. If you can make such a lovely, moist, cake that way, then why did they say, for all those years, that we had to fold in the flour. Wotta lotta tosh! Am really happy that I can now offer my kind visitors coffee or tea and cake. That is if I don’t scoff it all first. No, Alfie you’re not going to get any! Hi Liz, thanks so much for your comment…. Will make the cake for you next time you come over… Must keep doing things, can’t sit around vegetating! Have to keep off Amazon though…. have just splashed out on a luxury duvet for Alfie’s bed! Still, he deserves it, he’s being so good. Everybody loves him, he’s such a poppet!